I haven't posted in over a year as I went into retirement from blogging, but Akit's out of retirement for a special edition blog post! I was recently selected out of 1,600 applicants to participate in the SFMTA/Muni Mobile Fare App beta testing. From what I've read around, about 800 people were selected to be Muni's guinea pigs for this project. This reminds me of the days when I was a pilot tester for TransLink (old name for Clipper). Let's give you folks who didn't sign up or selected a taste of how this all works. First of all, you need to have a phone operating on Apple iOS or Android. 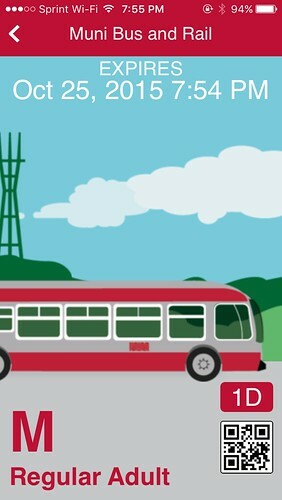 Once Muni releases the program to the whole public, you can download it at your application store for free. When you first use the app, you can choose to register for an account or you can look around the app. But if you want to buy fares, you must register for an account. The photo on the right is for adult fares, but you can also select Senior/Disabled/Medicare, Youth, and SF Paratransit options too. The prices are all the same as paying cash or Clipper, and has no credit card surcharge tacked on. Once you select the item(s) you want to purchase, you simply use the app to pay and it will direct you to a PayPal site to handle it. You can choose to pay with your personal credit or debit card, or if you have a balance on your PayPal account, you can use that too. Once your payment is confirmed, your ticket is stored in the "My Tickets" menu. Click the ticket you want and it will give you one last chance to back out. 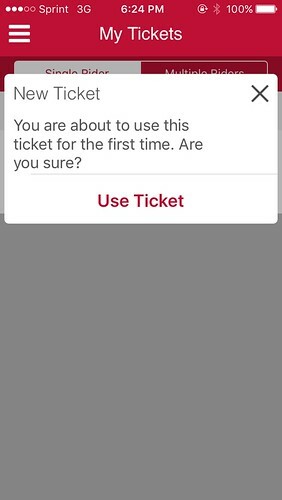 If you want to use the ticket, click "use ticket" and the ticket activates immediately. If you are using a single fare ticket, you should only activate it when you see the bus or train arriving. 90 minute clock immediately activates, and this will also be your Muni transfer; the driver will not give you a paper transfer. Once the ticket is activated, it will show an animated screen with blue skies, clouds (or is it Karl the Fog? ), Sutro Tower, and the Muni vehicle driving by every so often. The expiration will show on the top, and the type of ticket purchased on the bottom. Just show the screen to the driver to verify it's a legitimate fare, take a seat and relax. If you touch the screen, the background colors will change. GlobeSherpa who made the application must have done this to prevent people from fraudulently using the app by playing a video clip or showing a screenshot. If you touch the QR code on the lower right corner, it will show a large QR code that fare inspectors can use to verify your ticket. I haven't encountered one yet, but who knows if they will carry a device to verify the QR code or not. 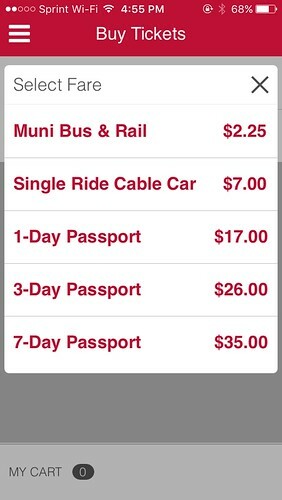 You can also close out the app and easily return to the Muni app to restore the ticket. Once it expires, the ticket still looks like it's valid, but it's not when you compare the top time of 7:55PM to the bottom time of 7:54PM (left photo), but once you return back to the main menu by clicking on the left arrow on the top and then restore the ticket, it will definitely say: "EXPIRED" (right photo). It's an odd quirk, hopefully something that can be fixed. When you don't have cash or your Clipper card on hand, it's an easy way to pay for your Muni fare. You want to pay for Muni with a credit card. If you don't want to disclose your credit card info, you can load some funds in your PayPal account and pay for Muni that way. You can buy Muni passports without visiting one of the few locations in the city for them. You can buy Cable Car tickets without hassling the conductor. It's eco friendly because you don't get a paper transfer or receipt in return. Faster than Clipper because once you pay for the ticket, you can activate it immediately. If you order something on Clipper via their website, it can take up to five days to activate. If you activate your single fare ticket after 8:30PM, your expiration will be 5AM the next day (a.k.a. late night transfers). Clipper cards and those paper tickets at the metro vending machines DON'T give you late night perks, just the lame 90 minutes. For single rides, you are better off paying cash to the bus or metro operator and getting a paper transfer. You'll always get a minimum of 90 minutes, but most hand torn paper transfers have much longer expiration, sometimes even four hours. If you transfer from BART, Golden Gate Ferry, Golden Gate Transit, or SF Bay Ferry to Muni you don't get the 50 cent inter-agency discount with the app, it's only good on the Clipper card. Make sure to pay for your ferry, BART, or GGT fare with your Clipper card, and use the same card on Muni to get your discounted ride. If you transfer from Daly City BART to Muni, you get two free rides, one away from the station on the 14R, 28, 28R, 54, and 57, and one going back on the same bus lines within 24 hours, but it's only on Clipper. They don't sell monthly passes, it's only on Clipper. Prepaid tickets have an expiration date. I bought mine on October 23rd, but if I don't use it, it will expire on January 21st. Not a good idea to hoard those tickets. You have a smartphone with a lousy battery. If the battery dies, you can't use the app! If you have a credit card that gives you a bonus when using it for travel (e.g. 2% on travel vs. the standard 1%), you won't likely get that bonus because it is charged through PayPal. If you use a pre-tax commuter benefit debit card, it looks like it's not supported on the app. It's because the credit card processing is done through PayPal which may not be acceptable to the required federal standards for commuter debit cards. Continue using your debit card on Clipper. However, do not link a your commuter debit card via your PayPal account. Muni and GlobeSherpa can do a handful of things to make it better. Make the expiration easier to read. A light blue sky background with white letters is hard on people, especially for the operator to read. White letters is fine, but some black shadow for the letters makes it easier. I was expecting some more backgrounds in the animation. Why just Sutro Tower? Why not Coit Tower or the Golden Gate Bridge? 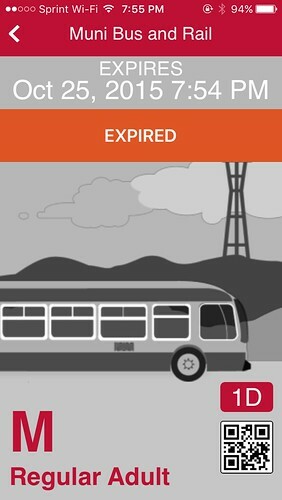 When a ticket expires, it needs to automatically grey out and the orange bar is shown saying EXPIRED. It should not be the normal background. Allow commuter benefit debit cards be accepted to purchase tickets. Fingerprint scan option to open the app, especially helpful to prevent your kids from accidentally activating your tickets. What about transferring the value of your Clipper card over to the app? Starbucks allows you to do this with their gift cards, so clearly the technology exists. Not going to happen. Clipper card value is a cash value like a debit card. 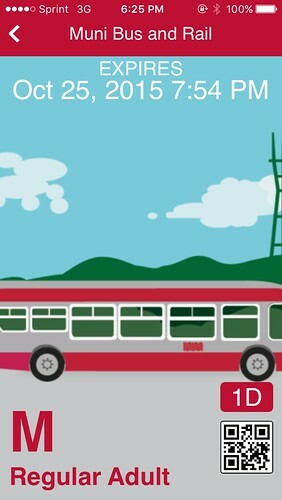 Muni's app is sold by the ticket. You are better off using the Clipper card for other perks and benefits like inter agency transfers. This seems nearly identical to a system used in Austin, including the changing background when you tap on it. I'm really curious how easy this is to abuse -- not that I'd encourage any such thing, it's just a curiosity. Things like if it trusts the clock on your phone to determine the activation and expiration dates, or what information is stored on the QR code. Or while the single rides are 90 minutes with a clear activation time, the passports have classically been a per-day thing, and I'm wondering if you could sit on the bus, see the fare inspector and quickly purchase a 1-day passport to avoid a very pricey ticket, or if it clearly shows when it was activated. While I understand not wanting to show a full QR code as it could include identifying info, could you scan it, sanitize any data and tell us what's there? Straver: I used a scan app to find out what the QR code says, it's a bunch of garbled language. I guess GlobeSherpa developed a way to decode it. I don't know what it says, but there's really no need for a QR code app as it's pretty easy to read the screen, verify by tapping it, and enlarging the QR code clearly states the date and time it was activated. As for abusing the clock, that's a possibility, but probably this company has found a way to not allow that to happen, otherwise the SFMTA wouldn't have approved its use. Thanks for telling us about your test run! My main concern is that people are still stealing cell phones on Muni, and this just seems like a great way that thieves can see what phones people have and grab them while we've got them in hand. Maybe I'm the only person concerned about it, but I'd love to hear your opinion. Rachel: Excellent point! It may be better to use a Clipper card, but I've been recommending in the past for Clipper is to use a sleeve or a cheap wallet to keep separately from your real wallet or purse. On the other hand, you don't have to flash it to the driver if you board through the back door. It's just like carrying a paper transfer through the back door, the drivers don't ask. I use the app at least twice a week and hoping that nobody official is reading this I found it to be a solution to getting a Muni ticket or violation. you buy the ticket keep it stored until you need it for example your on the bus and you see the muni police about to board the vehicle, you pull up the app and 1 touch you activate the ticket and your good to go. just a note the muni inspectors do NOT have the ability to read the bar code as of yet but they say its just weeks away.